Review Fedora 26, released recently, is a welcome update on the already very nice 25. As with Fedora's last couple of releases, there are three major ways to get Fedora 26 – Workstation, Server and Atomic Host. The Workstation release is aimed at desktop users and, by default, will install the GNOME desktop. Server and Atomic Host target, yes, servers and container-based deployments respectively. Fedora 26 brings an updated kernel, version 4.11, Mesa 17.1.4, and jumps to GCC 7. More visible changes include the latest version of GNOME, 3.24, a new partitioning tool in the Anaconda installer, and much better support for ARM processors, notably an official version of Fedora for Raspberry Pi, which appears to be much more stable than the previous release that appeared to have more caveats than features. The most obvious change is the move to GNOME 3.24. Nicknamed Portland, this version ships with quite a few new features and improved applications, including Night Light. Night Light is a new settings panel that tints the colour of your displays according to the time of day, although you can also manually control it if you like. In the evening Night Light makes the screen color warmer, which helps prevent sleeplessness and eye strain. The GNOME top bar shows when Night Light is on, and the system drop-down menu allows you to turn it off temporarily. That's handy if you want to edit photos or similar because what you see is not what you get with Night Light. There are quite a few third-party apps that already provided the features of Night Light, but none of them worked seamlessly with Wayland, which makes Night Light a welcome addition to the GNOME feature stack – it works with X11 too if you aren't on Wayland-capable hardware. GNOME 3.24 features an improved notification system, with a simplified layout and weather info integration – it will pull in a summary of the day's forecast for the location that you set in the weather application. GNOME applications updated in 3.24 include Web, Photos, Polari (yes, GNOME still ships with an IRC client, because one day we'll all realise that IRC was amazing and go back to using it), Games, Calendar and the Calculator. Of these, the most notable is Photos, which now adjusts your thumbnail size to make better use of the available space. Unfortunately, Photos still has only very basic editing tools, but it does make a good organiser. GNOME Software continues to see improvements in this release with new icons that make it easier to see which applications are installed. 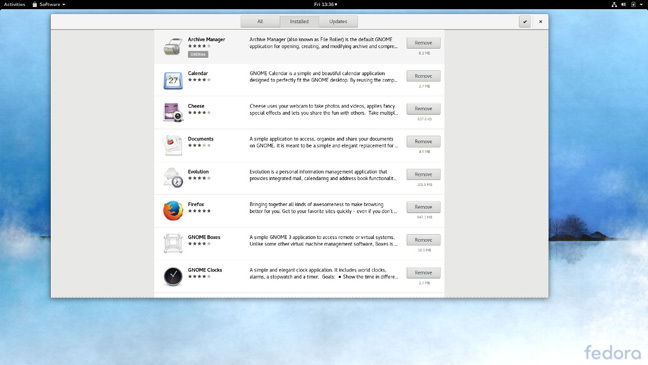 The installed applications view also now helpfully shows how much disk space each application is taking up. The Software app has also improved Flatpak support with a couple of minor new features though the number of apps available as Flatpaks remains disappointingly small. As you scroll through that list of installed apps checking the sizes, you'll probably notice one monster taking up more space than most – LibreOffice. Normally version bumps of LibreOffice are hardly worth mentioning, but this one contains the first look many users will get at the still-in-progress NotebookBar UI, which apes Microsoft Word's Ribbon interface. I happen to dislike Ribbon and by extension NotebookBar, but it will probably go a long way to making it easier for Office users to switch to LibreOffice. For the rest of us it's pretty easy to ignore – for now anyway. The Anaconda installer, that – while very different from most installers – has grown on me over the years. This release sees Anaconda rolling in the Blivet disk partitioning GUI, which is a huge user experience improvement. Blivet allows for drag to resize disk partitioning and makes it easy to set up LVM encrypted disks. Fedora 26 sports an updated version of Fedora Media Writer, which can create bootable SD cards of Fedora for ARM devices, handy if you want to install the new ARM version of Fedora on your Raspberry Pi. Media Writer will also notify you when a new release of Fedora is available. As is typical of Fedora, this release features plenty of updates for developers. You'll find Go 1.8, Ruby 2.4, Python 3.6, PHP 7.1, and the DNF 2.0 package manager. 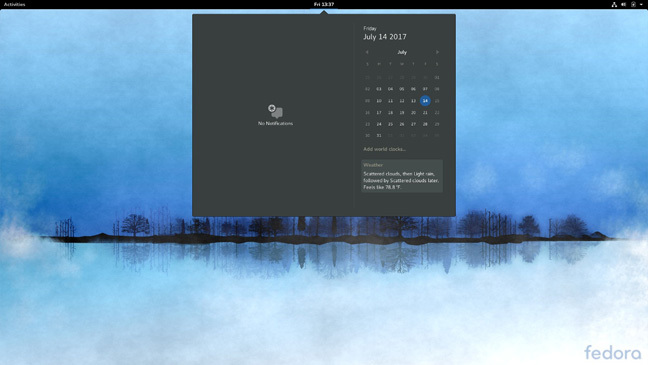 If GNOME is not for you, there are plenty of Fedora Spins worth checking out including versions with KDE, Xfce, Cinnamon, MATE, LXDE and the newcomer LXQT, which is the next-generation version of LXDE, built using the Qt framework. If you want to delve into the Fedora Labs, you can find versions of Fedora optimised for astronomy, graphic design, gaming, security, and development. I generally prefer to run GNOME with Fedora because the overlap of Fedora devs and GNOME devs is such that GNOME is nearly always just about flawless on Fedora, and 26 is no exception. Even the wallpaper feels perfectly suited to the stock GNOME theme. I've been using Fedora 26 since the beta was released earlier this year and have yet to experience any show-stopping bugs, though I did have to wait a bit for some apps as EPEL and Fusion support is often a little behind the main release. I've also got Fedora Server installed on a couple of VPS instances and haven't had any major issues there either. The server edition comes with one thing I haven't tested yet – the new Fedora Modularity project. Support is listed as a "preview", not to be used in production, but the project is soliciting developer feedback. The idea is to build a system that lets you have some elements be cutting edge, say a new kernel and the latest development release of Node, but stick with the stable version of your favorite database. As the project homepage puts it, the Fedora modularity project is for "when you want a rolling release. But not really." It's a very interesting idea that bridges the gap between a traditionally super-stable system, for example Red Hat and pure container-based system like Fedora Atomic. You can see video overviews of features and project goals here. So while there's no major features in Fedora 26, there's also an absence of showstoppers, making this Fedora a nice little upgrade.